The Museum would not have been built without the leadership of government officials including Mayor Bloomberg. Governor Pataki, Senators Clinton and Schumer, to mention a few. We thank them for their leadership in guiding a very complicated process and for helping to raise the funds needed to build the Memorial Museum. Under the direction of Joe Daniels, Alice Greenwald and their dedicated staff, we have a remarkable Museum that documents a tragic day in the history of our country, respectfully honors the nearly 3,000 lives lost and pays tribute to those who so bravely responded. The Museum will inform and inspire future generations from around the world about the bravery and resilience of our country. During my visit to the Museum, I had a chance to visit with many individuals who I've had the privilege of getting to know over the years. Family members like Anthony Gardner, who played a key role in historically preserving the footprints of the building, Margie Miller who provided support services to Long Island families for over 7 years, Edie Lutnick who supported the Cantor families, and Beverly Eckert's family, who were there to honor the memory of their brother-in-law, Sean Rooney, and the contributions of their sister, Beverly. I also had an opportunity to tour the Museum with Governor Tom Kean, Senator Joseph Lieberman and Congressman Christopher Shays, who played an instrumental role in the creation of the 9/11 Commission. 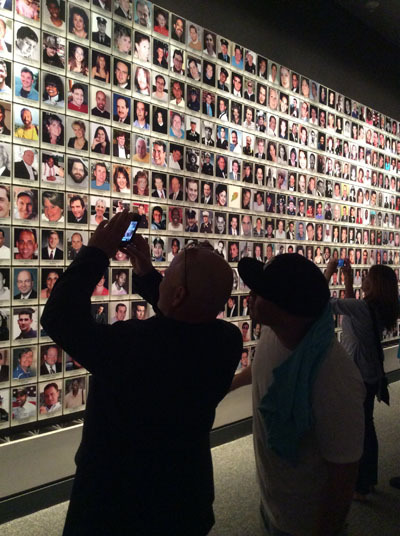 One of my most rewarding experiences was visiting the In Memoriam exhibition - the heart of the Museum - which includes photographs and mementos from our 9/11 Living Memorial Project. It was heartwarming to observe families gathered around the smart tables, reminiscing about the family photographs displayed there. I am profoundly grateful to Jan Ramirez and her staff of curators who have worked tirelessly to create such a moving exhibition. But most especially, I am grateful to the hundreds of family members and friends who we have had the pleasure of working with on the 9/11 Living Memorial and those who have generously supported our work. Your contributions will inspire the millions of people visiting the Museum who will learn about our loved ones in the In Memoriam exhibition. To all of you, thank you for making this special day possible. We look forward to continuing our work with you. Voices of September 11th (VOICES) is a 501c3 nonpartisan organization that provides information and a wide range of support services to promote resiliency and address the long-term needs of all those affected by September 11th; commemorates the lives and stories of September 11, 2001; and advocates for public policy reform to promote national preparedness. VOICES is committed to helping communities prepare for, respond to and recover from traumatic events, by sharing lessons learned that will promote resiliency and healing in the lives of those impacted by other tragedies.